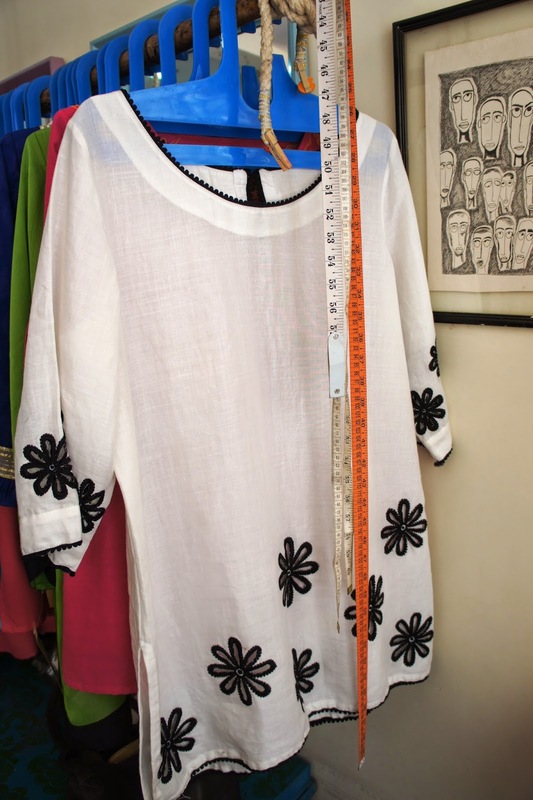 In the two years that I have lived in Bombay, I have not had the opportunity to have clothes made to my own design and fit. 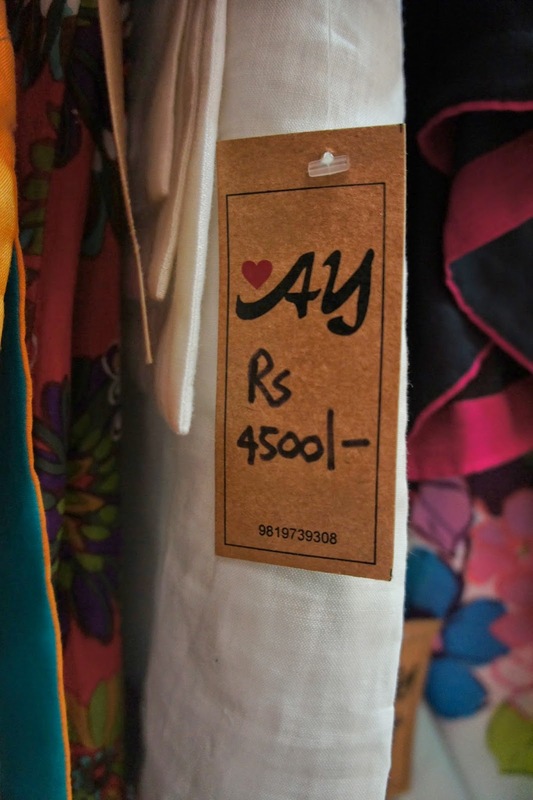 This is kind of crazy as tailors and dressmakers line every avenue of the city - and it is pretty much the norm for upper and middle-class Indian women to have their clothes stitched. But it is perhaps for this reason - because there are so many to choose from, and probably all of differing standards - that I never got on with it. It was too daunting. What I really needed was a recommendation. Which is finally what I have! I heard about Ayesha Kumar a while ago through a friend of a friend. I had been meaning to visit her shop in Colaba for several months but never seemed to get around to it. But last week - and requiring a dress to be made for a charity event, I finally got to meet the lovely Ayesha Kumar. 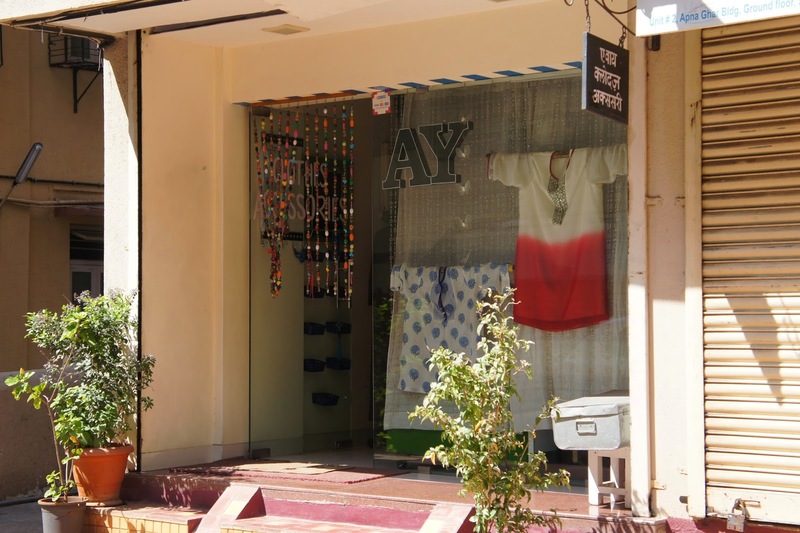 Tucked away in a quiet enclave off busy Colaba Causeway, is the AY Store - a place where Ayesha showcases her designs and consults with clients. 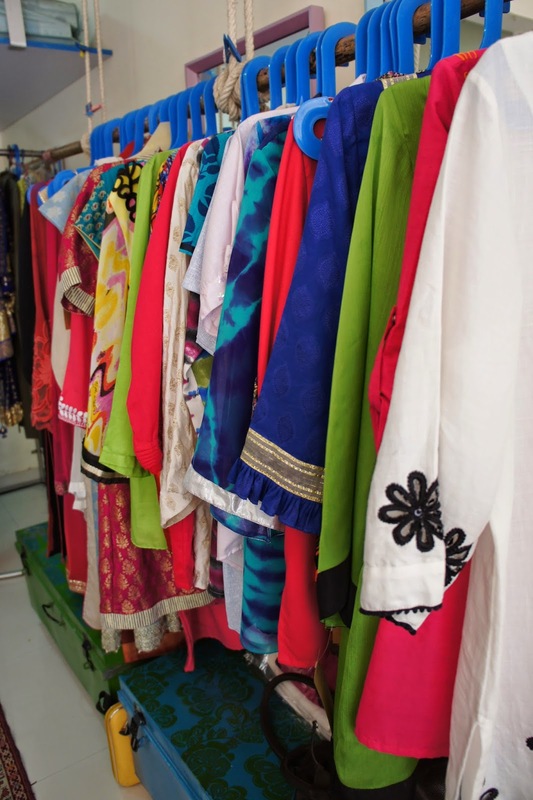 The racks are full of beautifully embroidered tunics, shirts and dresses as well as plainer, more casual items. And although she makes traditional Indian clothing (including wedding gowns) - a lot of the designs are Western with an Indian influence. Mumbai born and bred, Ayesha tells me that years ago, she started making her own clothes at home after never being able to find what she wanted. Everything seemed so mundane to her and she wanted to be sure that when she went out - that she was not wearing the same thing as anyone else. 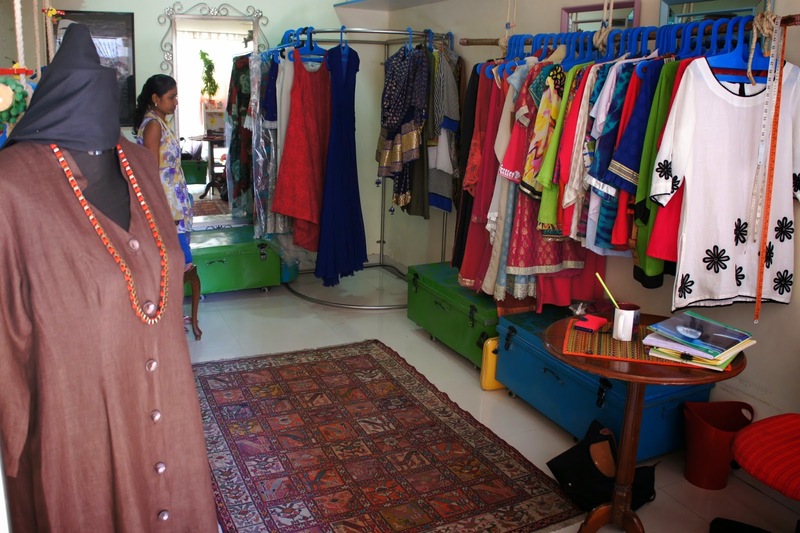 In 2009, Ayesha translated her talent into a formal business, by creating a shopfront in Colaba. Designing everything herself and shopping for fabrics personally, she utilises three skilled tailors to produce her work. Of course, she collaborates with clients to produce exactly what they want and very usefully (and perhaps unusually) - she specialises in designs for the fuller figure. (Phew for me!). 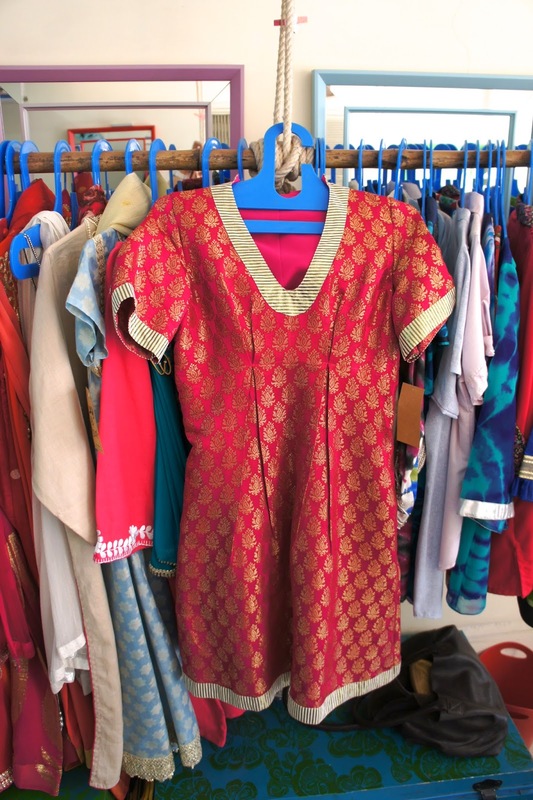 I have found that being a larger size myself, (or merely being of a Western stature that tends to be larger than the average Indian size), it can be difficult to find decent clothing in this city. So far, I have been reliant on Anita Dongre and Global Desi. It would have been much better for me if I had discovered Ayesha earlier on! 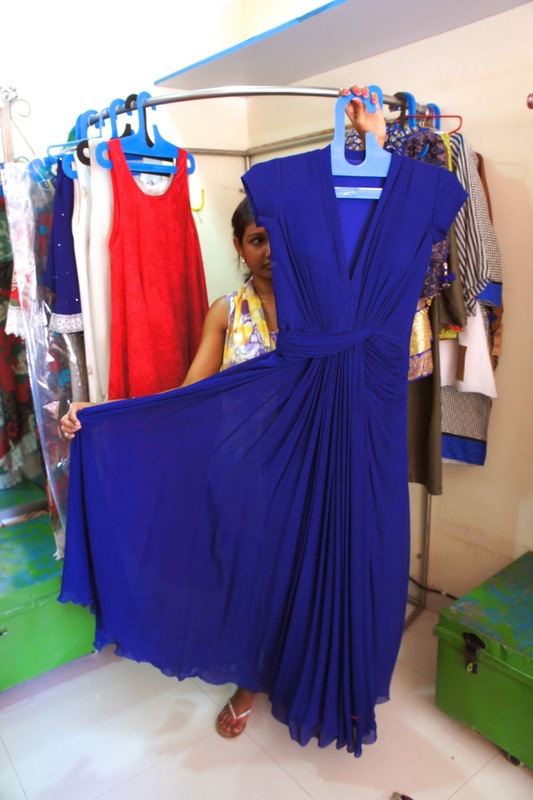 Ayesha also explains to me that she works well with clients who have little time to take care of their wardrobes, or those who need help with styling. She basically acts as a confidence booster to such women by helping them to look good in the right fabrics and the right colours. Yay for Ayesha! As I glance at the rows of samples on the racks, I come to realise that the prices are very reasonable for such bespoke work. 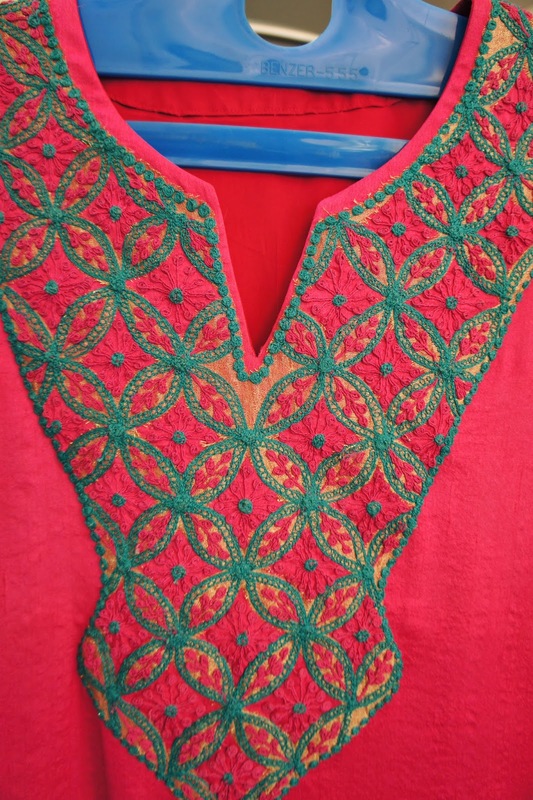 A floaty top starts at 2,500 Rs and more detailed, embroidered pieces start at 4,500 Rs. (£25/£45 or $35/$55 respectively). 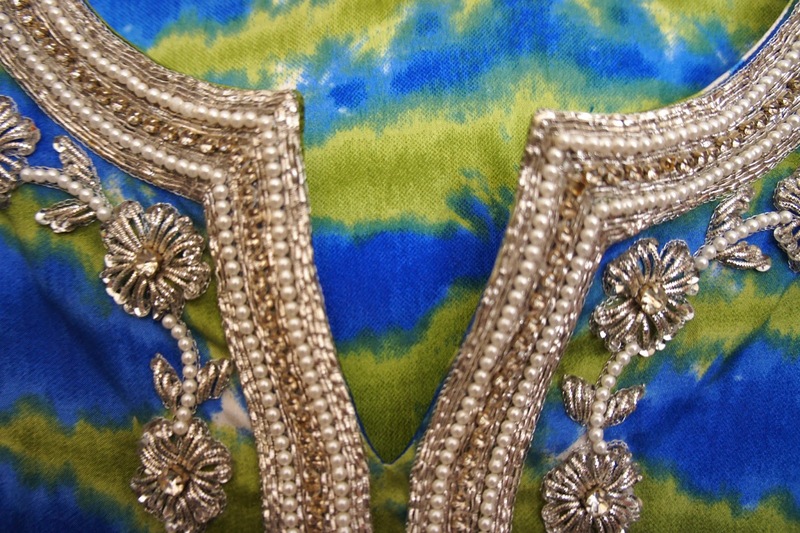 I take a close look at some of the embroidery work and I am impressed. 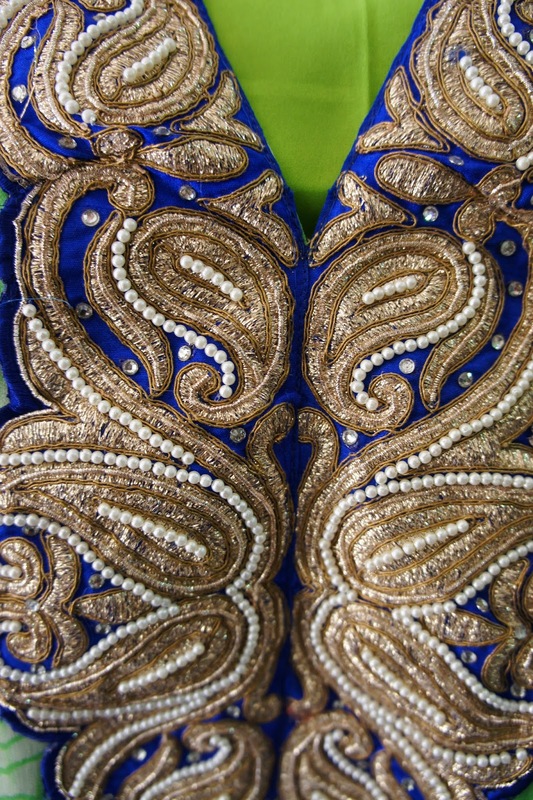 Even for a westerner who prefers their clothes to be unembellished, I am being attracted to the gold and silver threads and beads like a magpie. 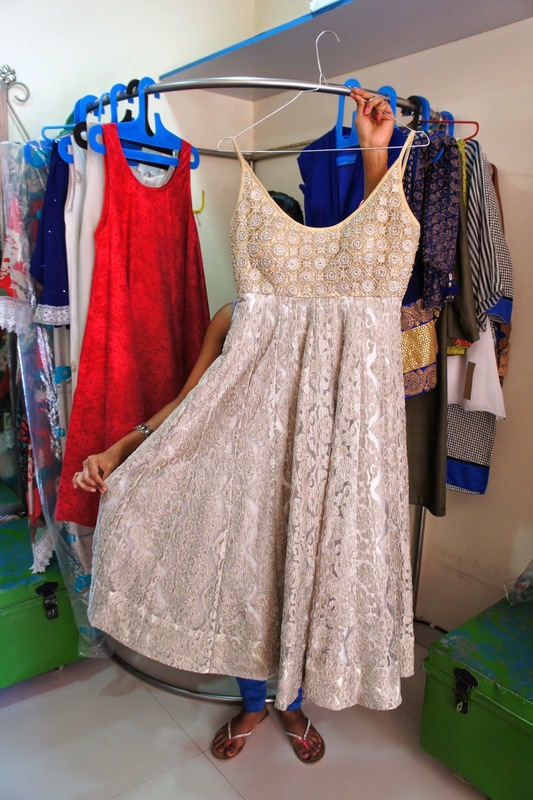 Timing is not a problem - it generally takes 15 days to get a plain dress made but if you have an urgent situation, Ayesha can probably help you out in seven days. Even if the item requires embroidery. Although Ayesha specialises in larger sizes, I can see that she must have quite an eclectic clientele. 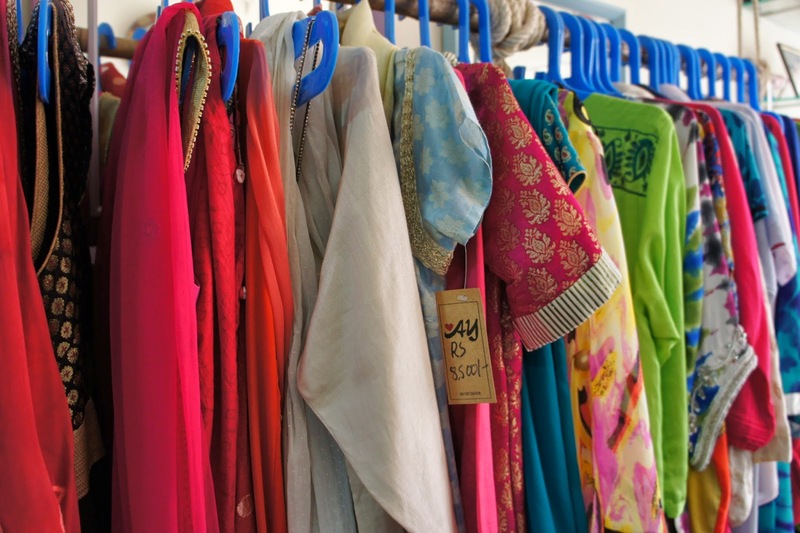 On the racks are gorgeous prom-style floaty evening dresses; brightly coloured, shorter tunics to be worn over churidar for the younger set; elegant linen dresses for the stylish larger women; kurtas with fine detailing around the pockets and necklines; and beach cover-ups in gossamer fabrics to slip on over swimsuits. 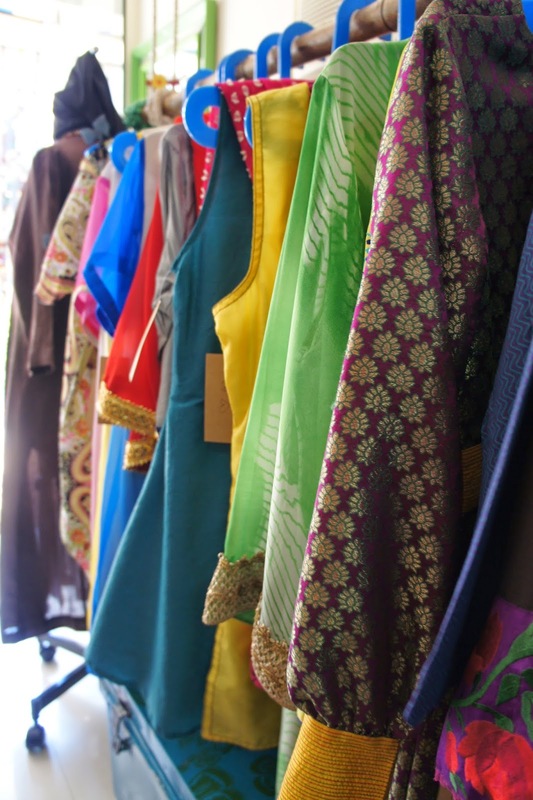 Really, there is something for everyone, and if there isn't - Ayesha can design and make it for you! (By the way, an evening gown will cost 12,000-16,000 Rs depending on the level of detail and embroidery, and Ayesha can also quote for Indian wedding attire). 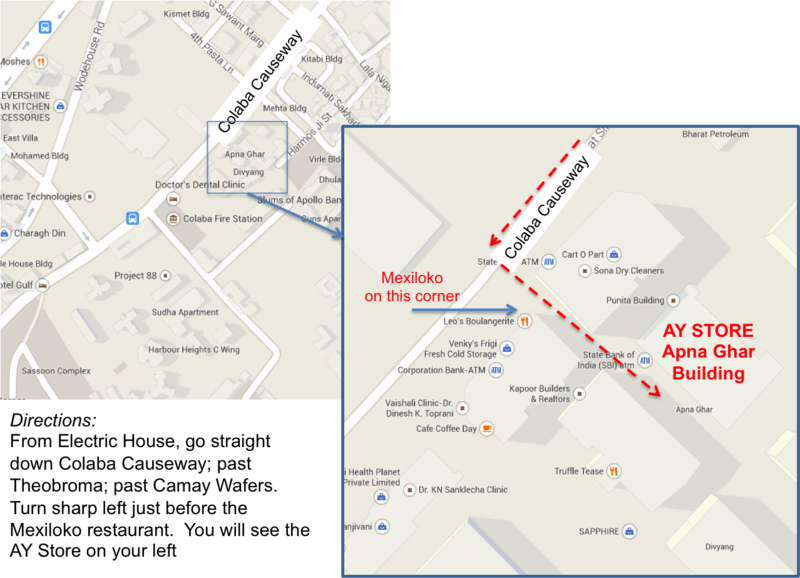 The store is well worth a visit for a private consultation, but you can also work over the email with Ayesha. I am currently working with her to design an embroidered evening dress in black georgette and lace....watch this space! 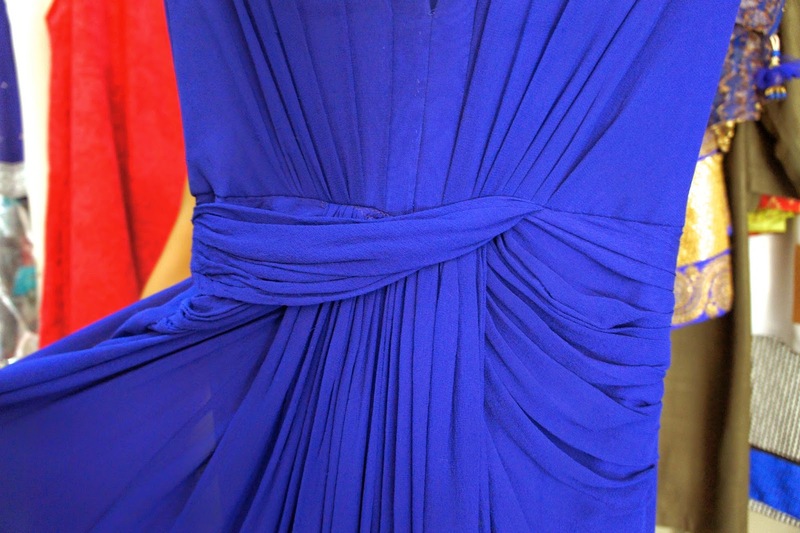 This gown is to do die for - - detail of the pleating below. 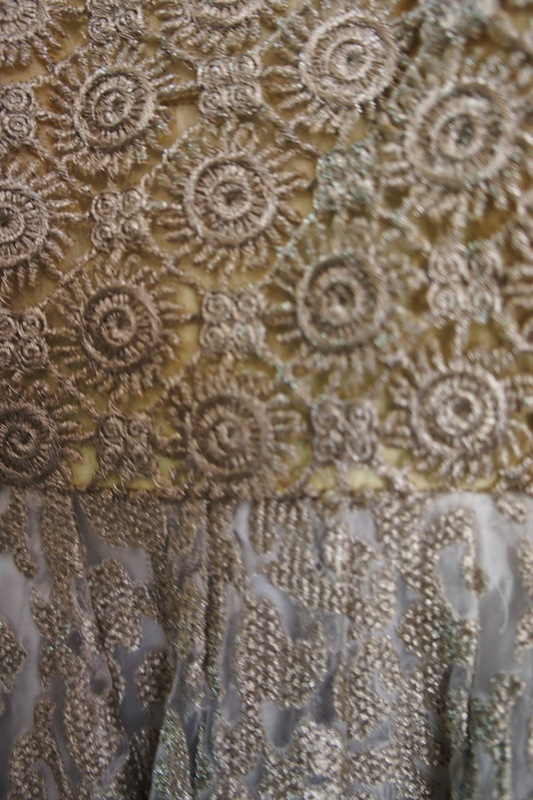 I also adore this dress - the gold brocaded fabric is detailed below. A good design for covering tummies! 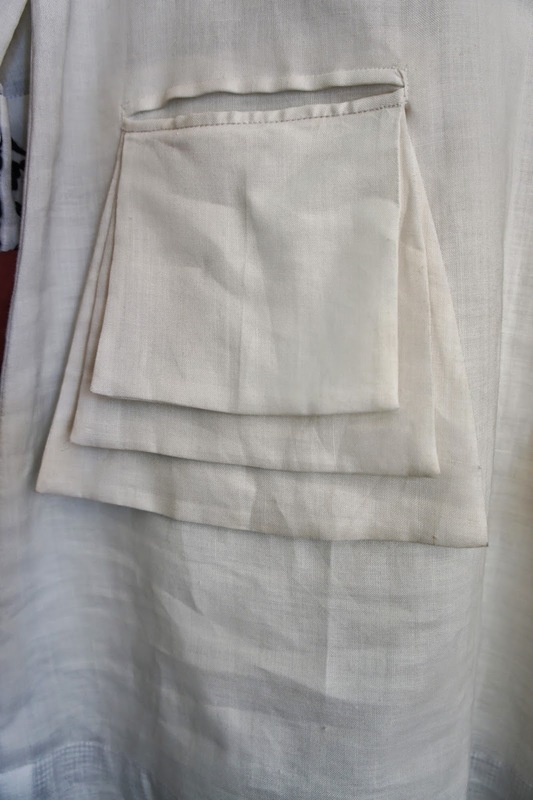 the collar and cuffs and the unusual pockets. This embroidery/braiding is beautiful. 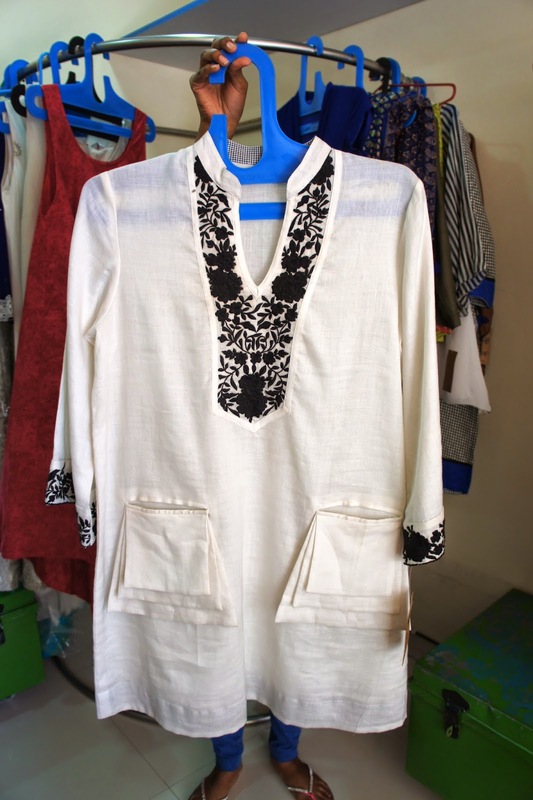 The top (below) would be perfect as a beach cover up or even with jeans or white pants. 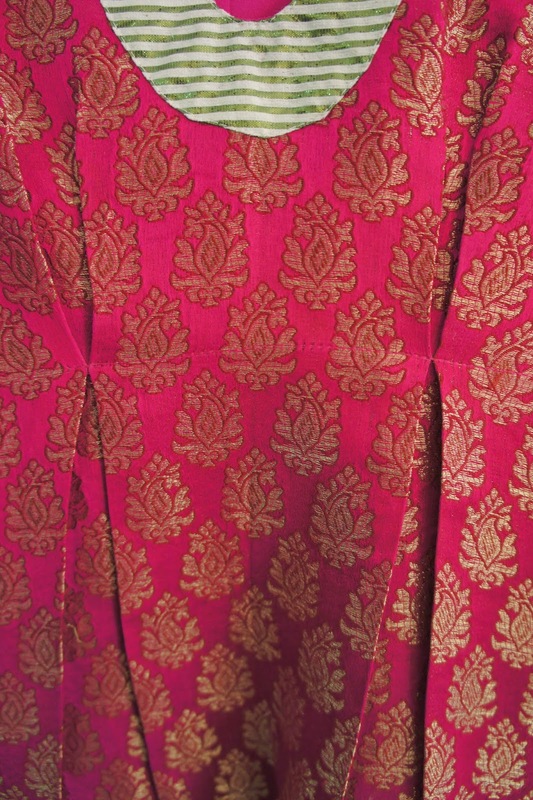 Appealing to a younger audience is this brocaded pink kurta - lovely pin-tuck detail below. 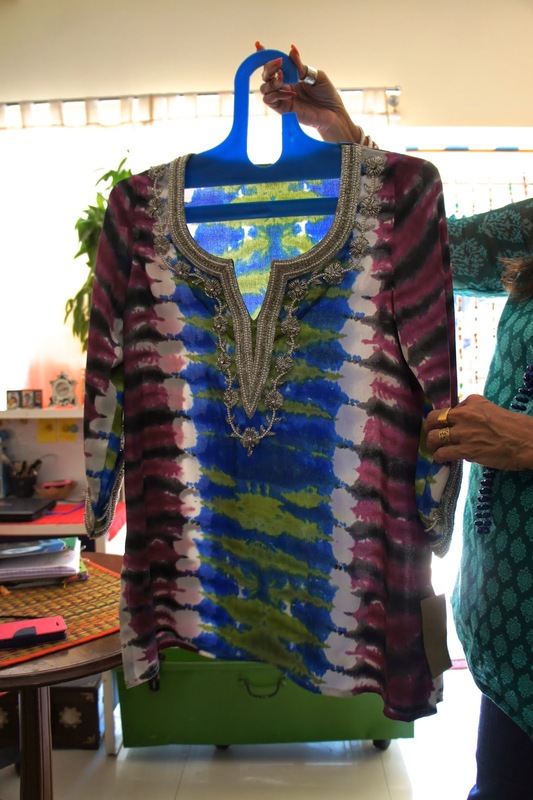 This top would be perfect with pink churidar leggings. on the bodice is stunning. I am working with Ayesha on a black version of this dress - perhaps with some embroidery. 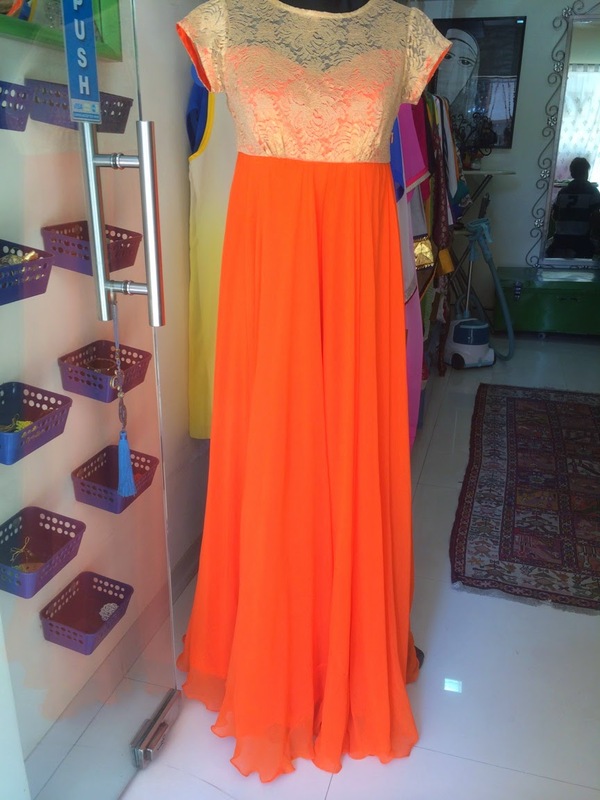 Have this elegant gown made in any colour with your choice of detailing around the neckline. 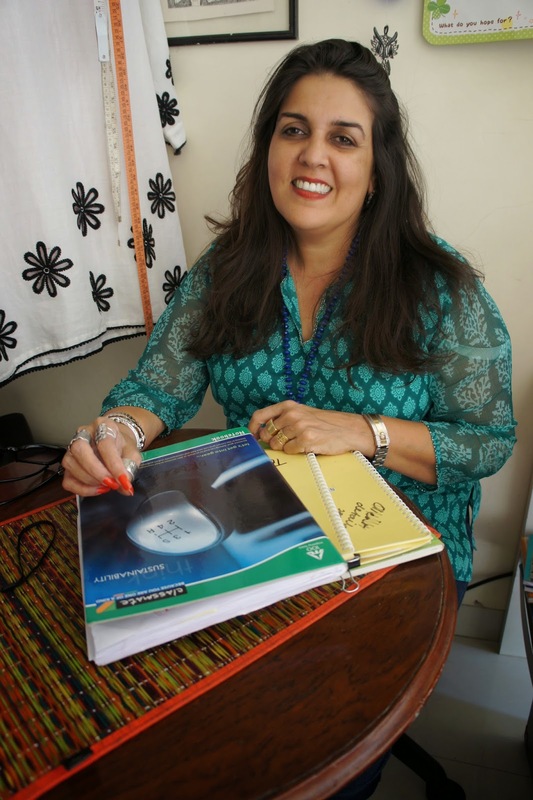 Ayesha is happy to come to your home for an initial consultation and measurement taking! Looking very beautiful..... by looking at it anyone will buy salwars online..